Cover and instrument panel re. Stop (for manual box cover) left. Sheet metal screw Covering windowr. 25 F 68 027 paneling a.A. a.A.
0 F 68 112 Middle cover (on housing) a.A. a.A.
51 F 68 113 Type designation "220 D" a.A. a.A.
F 68 133 Cover and instrument panel re. 0 D 68 610 Cover.instrument.button on.forehead a.A. a.A.
F 68 141 Cover left R.L. F 68 143 Cover right R.L. 0 F 68 145 Front tunnel cladding cover a.A. a.A.
60 F 68 149 Front wall cladding, left side a.A. a.A.
0 F 68 151 Fairing right a.A. a.A.
0 F 68 152 Fairing right a.A. a.A.
0 F 68 153 Front wall cladding, right side a.A. a.A.
F 68 158 Instrument panel R.L. 67 F 68 164 Stop (for manual box cover) left. a.A. a.A.
0 F 68 165 Right stop a.A. a.A.
68 F 68 166 Screw a.A. a.A.
0 D 07 014 Toothed washer f. starter bodies a.A. a.A.
71 F 68 177 hinges a.A. a.A.
73 D 68 950 plug-in nut a.A. a.A.
75 F 68 180 Garnish moulding a.A. a.A.
0 D 68 950 plug-in nut a.A. a.A.
0 G 68 347 Sheet metal screw load floor re.a.crosswise a.A. a.A.
0 G 54 677 sheet-metal screw a.A. a.A.
84 F 83 061 duo clip a.A. a.A.
91 F 68 191 glove box a.A. a.A.
0 F 68 193 Glove box R.L. 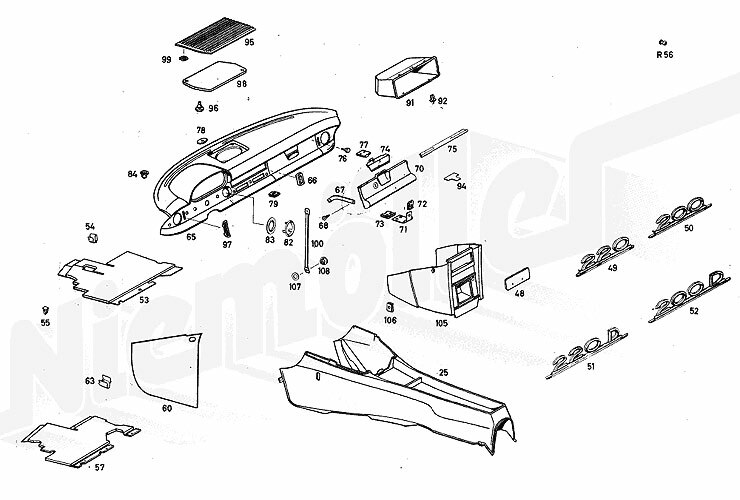 a.A. a.A.
94 F 68 196 Underlay (under locking part) a.A. a.A.
95 F 68 197 Grille (for loudspeakers) a.A. a.A.
97 F 68 201 Decorative frame (for operating lever) a.A. a.A.
98 D 68 233 Cover for loudspeaker cut-out a.A. a.A.
100 F 68 206 Support a.A. a.A.
105 F 68 207 Housing a.A. a.A.